The first season of Star Wars Rebels ended with our Ezra Bridger and the rest of his ragtag Rebel Family saving his best friend and teacher Kanan, who was being held captive by the Empire. It also marked the return of Ahsoka Tano, who hasn’t been seen since the end of Clone Wars. But “Siege Of Lothal” helped establish the setting for Season 2 of Star Wars Rebels by bringing in Darth Vader to help flush out the Rebel forces and force them to retreat. Clearly outmatched, our heroes must now set out on a new path if they have any chance of taking down the Empire. We got a chance to view a new trailer for Season 2 of Star Wars Rebels today at New York Comic-Con, and now Disney has released it online. Check it out here below. Having already seen the first two episodes of Season 2 and talking to creator Dave Filoni, I can say that I can’t wait to see what Filoni has in store for us. This newest trailer only fuels my anticipation. With so many new stories, and a new threads that connect to Clone Wars, it will be one very exciting season full of bounty hunting, piracy, familiar faces, star fighter dog fights, and of course lightsabers. There will also be some interesting story arcs that this season will explore. It looks like the Inquistors are being dispatched to retrieve young children who share the same Force wielding potential as Ezra, whom we also see questioning himself on whether or not he is a real Jedi. And then there is the fact that there is a bounty on Sabine’s head. The trailer also reveals that The Seventh Sister (Sarah Michelle Gellar) has some sort of connection to Ahsoka. In “Star Wars Rebels” Season Two, past lives will be revealed and the destiny of our heroes will be changed forever. The transformative new season resumes with Imperial oppression on Lothal growing stronger and the rebels seeking out new allies and additional resources to sustain their fight against the evil Empire. With the help of Ahsoka Tano, the crew of the Ghost enlists some old friends: ex-clone troopers who fought in the Clone Wars. As the rebels grow in number, so do their enemies. New Inquisitors are dispatched by Darth Vader and sent to crush any threat of rebellion. Through dangerous rescue missions, thrilling space chases, and spectacular lightsaber duels – the bond of our rebel crew will be put to the test like never before. 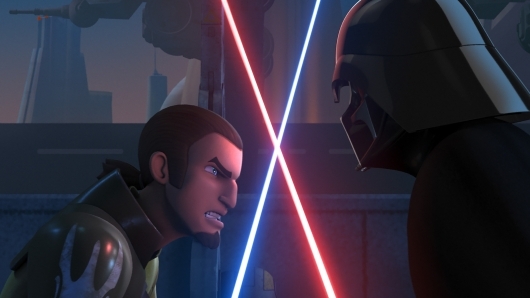 Star Wars Rebels Season 2 will begin airing on October 14, 2015 at 9:30pm/8:30c on Disney XD. We’ll have more details about the new season from our participation in the Star War Rebels press day, as well as the show’s panel today at NYCC. Keep it here at Geeks Of Doom all weekend for our on-site coverage of NYCC 2015 and follow us on Facebook and Twitter for updates.